Digital transformation encompasses both technological and human components. While many initiatives focus on ensuring that a company’s multi-cloud infrastructure is agile enough to meet changing demands around cloud mobile, Internet of Things (IoT), and big data, it’s equally important to empower business workers with the modern digital tools they need to be successful today. Artificial intelligence and machine learning can play a vital role on both of these fronts. In fact, 78 percent of CIOs and senior IT leaders are already looking to AI to address complexity, and by 2019, 30 percent of IT service desks will utilize machine learning to free up support capacity. The magnitude of change has forced companies to take stock of the experience they offer employees. As digital natives enter and advance in the workforce, talent retention is now a top priority. These workers expect to have the best tools; 93 percent of millennials cited modern and up-to-date technology as one of the most important aspects of a workplace. Employees no longer want to use traditional web-based forms to request a service and expect seamless omni-channel experiences. As artificial intelligence (AI) and automation technologies weave their way into the enterprise, organizations must evolve to meet new expectations for how service is delivered to employees. The next stage of the journey embraces and integrates these technologies to create the new intelligent workplace. With a proliferation of devices, social media, and cloud services, uniting generations in the workforce is more of an advantage today than ever before. 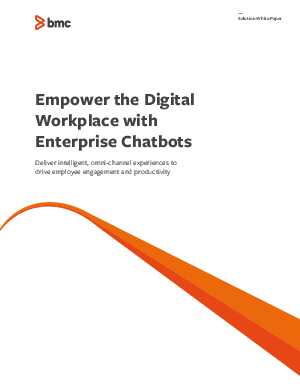 This white paper will help you understand how work gets consumed and done in the cognitive era, and how to seamlessly merge technologies at work to meet employee expectations with enterprise chatbots.